Europe District Cooling Market size will exceed USD 40 billion by 2024, as reported in the latest study by Global Market Insights, Inc. Acceleration in the demand for space cooling systems along with growing concerns pertaining to carbon emissions will drive the market size. Extreme climatic conditions across the region including Sweden, Italy and Germany will stimulate the product penetration. For instance, in 2017, the number of annual cooling degree days (CDD) in Italy were 295 when compared with 200 in 2016. Ease of parity, economies of scale in long run and high standard of operations & maintenance are some of the key features which will stimulate the Europe district cooling market size. In addition, the high reliability & flexibility of systems with various production techniques will positively influence the business growth. 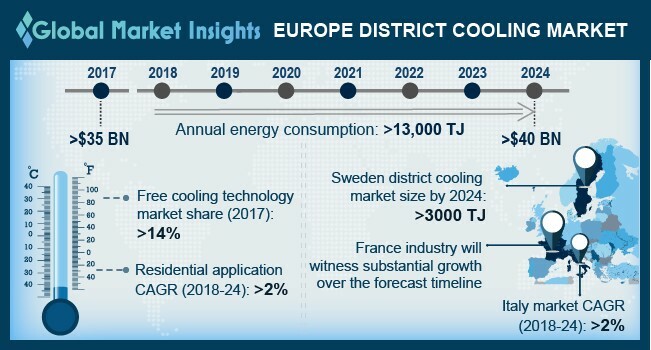 Sweden district cooling market is set to reach over 3,000 TJ by 2024. Increasing penetration of renewable energy technologies owing to ambitious government targets toward sustainable technology adoption will fuel the business growth. Geographical proximity to the gulf stream across the nation will further encourage the product adoption. The government of Sweden in 2017, has planned to invest USD 103 5 million toward development of renewable energy sector by 2020. Commercial district cooling market share is set to grow owing to increasing emphasis on energy efficiency and sustainable building solutions. The increasing commercial floor space on account of flourishing service sector along with ongoing investments toward infrastructure development will stimulate the industry growth. According to European Real Estate in fourth quarter of 2016, the investments across commercial establishments were valued at USD 107.8 billon. Heat pump district cooling market is set to witness a growth of over 2% by 2024. Increasing adoption of product across Northern Europe owing to its ease of compatibility with conventional heating technology will foster the industry growth. These pumps are being widely used for cooling and heating purposes across residential and commercial establishments. The technology uses waste heat to generate energy thereby, reducing the carbon emissions effectively when compared with its competitive counterparts. Technological advancement in product development and design along with ongoing R&D activities will propel the product growth. Increasing government focus toward sustainable and energy efficient establishments along with stringent emission reduction targets will propel the district cooling market in Europe. The EU’s “Renewable Energy Directive” has enforced standards toward the limitation and reduction of emissions caused by industries established across the region. France district cooling market will grow on account of stringent government norms toward the adoption of energy efficient technologies along with accelerating population across the nation. In addition, the ongoing development of energy management systems coupled with increasing investments toward innovative energy efficiency solutions will stimulate the DC grid network. Notable players catering the Europe district cooling industry include Engie, Logstor, Alfa Laval, Ramboll, Siemens, Veolia, Helen, Wien Energi, Vattenfall, Goteborg Energi, and Fortum. Major industry players are focusing toward product customization and continuous research and development activities as a key strategy to sustain their presence across the region.